Fred Goldsmith is a Pittsburgh lawyer who represents individuals and families in Pennsylvania, West Virginia, and Ohio, in admiralty & maritime, towboat and barge, river accident, Jones Act, Railroad, FELA, motorcycle, ATV, oilfield & drilling rig/oil and gas well explosion, serious personal injury, and wrongful death lawsuits. He is also a trained mediator. Fred is known for his tenacity and willingness to accept challenging cases. He is the managing member and co-founder of Goldsmith & Ogrodowski, LLC. Fred’s legal experience includes service as Law Clerk to a U.S. District Court Judge, Vice President & General Counsel of one of the country’s largest tugboat operators, and an attorney with large and medium sized law firms in Pittsburgh, Pennsylvania, and Houston, Texas. He has tried cases to judges and juries in both state and federal courts. While for many years Fred represented corporations and their insurers, he now uses what he knows from representing defense interests to vigorously represent individual workers and their families. Fred has also been included in the listings of “Pennsylvania Super Lawyers℠” by Philadelphia and Law & Politics magazines, from 2006 to 2008, and in 2017 and 2018, a designation only 5% of Pennsylvania lawyers achieve. Fred obtained his B.A. and J.D. degrees from Tulane University in 1983 and 1990, respectively. After graduating law school, he worked as a law clerk to the Honorable Howell Cobb, U.S. District Judge for the Eastern District of Texas, learning valuable trial and legal writing skills from the judge (a former railroad defense lawyer) and the many talented civil and criminal trial lawyers from around the Gulf Coast who appeared before the Court. He is also a graduate of the National Institute for Trial Advocacy’s intensive 8-day trial skills course. While an in-house lawyer at the tugboat company, Fred was a member of the five-man management team which successfully busted “unbreakable” 28 and 43-year long tugboat monopolies at Port Canaveral and Port Everglades, two Florida seaports. He also oversaw all personal injury and property damage litigation involving the company’s fleet of forty harbor and oceangoing tugs in ports throughout the Great Lakes, in San Juan, Puerto Rico, Pearl Harbor, Hawaii, and Florida. Fred grew up in Pittsburgh. Before finishing his formal education, he swept floors, stacked, and bound lumber at a building supply supercenter near Pittsburgh, drove a delivery truck in New York City, worked nights and weekends as a busboy and drive-up bank teller in New Orleans, tutored first graders in math and English in a Beaumont, Texas, public school, and in a Houston juvenile detention center counseled youths awaiting trial on felony charges. For four years between college and law school, Fred worked in the TV news business, first as a general assignment and medical beat reporter, then chief photographer, in the news department of KAMR-TV, the NBC station in Amarillo, Texas. While working in the Texas Panhandle, he was often a one-man-band: videotaping, reporting, and editing feature stories on the rough-hewn men and women in the 26 counties of the Panhandle, including game wardens, farmers, and ranchers. His station allowed him to attend the National Press Photographers Association’s (NPPA) intensive News Video Workshop held in Norman, Oklahoma, on the University of Oklahoma campus. Next, as a member of the IBEW (International Brotherhood of Electrical Workers) union, Fred worked as a cameraman and “live” truck operator for WLVI-TV’s “The News at Ten” in Boston, Massachusetts. Although a newcomer to big-market TV news, Fred was nominated for a New England TV News Emmy Award for video he shot of the tragic self-beaching of baby pilot whales on the Cape Cod coastline, their recovery in Boston’s New England Aquarium, and subsequent return to sea from a NOAA research vessel. He now calls on the reporting and video production skills he acquired working as a television news journalist and photojournalist to present his clients’ cases in an understandable and visually compelling manner in pre-mediation day-in-the-life videos, and at trial to judges and juries. Before returning to the northeast, Fred Goldsmith was a trial lawyer at two firms in Houston, Texas, where he represented, in state and federal courts, commercial vessel owners and operators, major and independent oil and gas companies, onshore and offshore drilling contractors, and oilfield service contractors and suppliers, in admiralty & maritime, personal injury and death, property damage, and commercial claims and disputes which arose in the oilfields of Texas, Louisiana, and the Gulf of Mexico. He also represented commercial and recreational vessel manufacturers in personal injury and death and product liability lawsuits involving propeller guarding of waterskiing boats, boat and marina fires, electrocutions, and assorted vessel design cases. Fred now brings to bear his substantial experience in oilfield and admiralty & maritime litigation to help injured workers and their families in Pennsylvania, West Virginia, Ohio, and beyond. Fred Goldsmith has been a dirt bike rider for over 14 years, and is the former secretary and newsletter editor of the western Pennsylvania dirt bike riding club, Three Rivers Competition Riders (Facebook page). 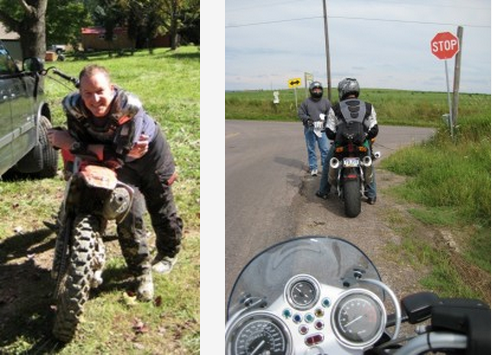 He holds a Pennsylvania motorcycle operator’s license, has successfully completed the Pennsylvania Motorcycle Safety Program’s Basic Rider, Experienced Rider, BRC2, and Advanced Rider courses, and includes street bike riding on his list of passions (the photo below left shows Fred with his Honda CRF-250X — he’s since traded that 4-stroke for a KTM 2-stroke — and below right is while riding his BMW R1150R in the countryside of Washington County, PA — Fred also rides a Triumph Speed Triple). He has been a member of Pittsburgh’s Sport Bike Alliance, which promotes safe street bike riding. In his law practice, Fred and his partner, Rich Ogrodowski, handle claims and lawsuits arising from motorcycle (both street bike and dirt bike) accidents and ATV (all terrain vehicles, quads, 4-wheelers) accidents. Fred Goldsmith believes there’s always more to learn. When he moved his law practice from the “blue water” (oceangoing) port of Houston to the “brown water” (inland) port of Pittsburgh, to learn first-hand the challenges towboat pilots and captains face, he sat alongside them and successfully completed the River School’s U.S. Coast Guard-approved Radar Observer License Endorsement Course. Fred has also taken the sticks in his hands and experienced steering a towboat and its tow of loaded jumbo coal barges downbound between the bridge piers of the twisty Monongahela River. In his law practice, he routinely gets out of the office to meet with and get to know his clients and their families in their homes, visit the scene of accidents, interview witnesses, and see up close and lay his hands on the equipment involved in the lawsuits he brings. Fred Goldsmith has authored numerous (see below) articles on admiralty and maritime law and courtroom tactics in legal and maritime industry publications including the Tulane Maritime Law Journal, Pennsylvania Law Weekly, WorkBoat, MarineNews, and Gulf Shipper. He also speaks frequently on these topics. He is an advisory editor of the Loyola Maritime Law Journal, published by Loyola Law School in New Orleans, Louisiana. Fred has twice served as an invited brief judge for the Annual Judge John R. Brown Admiralty Moot Court Competition, sponsored by the University of Texas School of Law, and as a volunteer judge for the American Bar Association, Section of Dispute Resolution “Representation in Mediation” competition, held at West Virginia University School of Law, Morgantown, West Virginia. In November 2012, Fred Goldsmith launched the internet blog, Towboatlaw – Towboat & Barge Lawyer: Admiralty & Maritime Law on the Rivers, a continuation of a tradition he began with Marine Legal Update and Admiralty Update, e-newsletters he originated in 1997. You can view current posts on the blog and subscribe to e-mail notification of new posts by clicking the BLOGS link atop this website or by clicking here: http://towboatlaw.wordpress.com. Towboatlaw is intended to keep towboat and other commercial vessel crewmembers updated on state and federal court admiralty & maritime law decisions that impact their lives and livelihoods. Fred Goldsmith is an active member of the Allegheny County Bar Association (elected Chair for 2011-2012 of the Federal Court Section and longtime member of the (state) Court Rules Committee), the U.S. District Court for the Western District of Pennsylvania’s Local Rules Advisory Committee (by appointment), the Maritime Law Association of the United States (elected as a Proctor Member and serving on the Inland River Practice, Marine Torts and Casualties, and Recreational Boating Committees), the American Association for Justice (Admiralty Law Section), the West Virginia Association for Justice, and the Western Pennsylvania Trial Lawyers Association. Fred is a former member of the board of directors of both the Waterways Association of Pittsburgh and the Pittsburgh Maritime Club, and a former member of American Inns of Court chapters in Pittsburgh, Cleveland, Houston, and New Orleans. He is a member of the Legal Committee of and a cooperating attorney for the American Civil Liberties Union of Pennsylvania’s Greater Pittsburgh Chapter and a member (and former member of the Board of Directors) of the Pittsburgh Area Jewish Committee, a nonprofit human rights organization. Fred is also is a member of the ADR, or Alternative Dispute Resolution, Committee of the WV State Bar. Fred Goldsmith is licensed to practice law in Pennsylvania, West Virginia, and Ohio, and practices in other parts of the country on motion, often with local counsel. Fred is also a member of the bar of several federal trial and appellate courts in Pennsylvania, West Virginia, Ohio, New York, Texas, Michigan, and Illinois, and practices before federal agencies including the U.S. Coast Guard, U.S. Army Corps of Engineers, Federal Maritime Commission, and U.S. Bureau of Customs and Border Protection. Fred has completed the Basic and Advanced Mediator Training courses staged by the West Virginia State Bar. He is a member of the ADR (Alternative Dispute Resolution) Committee of the West Virginia State Bar. With substantial experience trying cases to judges and juries in both state and federal courts and over twenty years of litigation and mediation experience representing both plaintiffs and defendants in admiralty & maritime, personal injury, wrongful death, property damage, product liability, and insurance coverage litigation, he is well-situated to serve as a neutral to assist others with resolving their legal disputes. This page is for informational purposes only. Case results depend upon a variety of factors unique to each case. Case results in prior cases do not predict similar results in any future case.